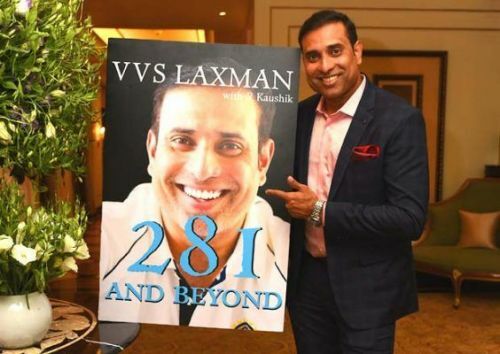 "Vangipurapu Venkata Sai Laxman, commonly known as VVS Laxman, is a former Indian cricketer and currently a cricket commentator. He is known for his numerous match-winning and match-saving innings, and his special ability to consolidate unprecedented support from non-specialist tail-end batsmen to do this accorded him a unique status among cricketing legends." This is what Wikipedia says about VVS Laxman. It’s not often that they get it right, but they got it spot on with this gentleman. And what better time to celebrate the immense success that this “Nice Guy” of Indian cricket brought to his fans, than when he’s launching his new book, “281 and Beyond”. We are all in awe of the famous “Fab Four” of Indian cricket comprising Sachin Tendulkar, Rahul Dravid, Sourav Ganguly and VVS Laxman (and yes, I’m aware of the fact that It wasn’t really required to name them). Each one of them has different qualities which left us astonished. With Tendulkar, it's his sheer talent and what he has achieved in his cricketing career; with Dravid, it’s just his numbers and that grit to serve his country; and as for Dada, he literally changed the fate of Indian cricket with his behaviour and leadership, both on and off the field. But when it came to Laxman, it was never about his numbers. He scored 8,781 runs at an average of 45.97 from the 134 Tests he played, an impressive record for a lower middle order batsmen. But he’s not a member of the sacred 10,000 elite group, while his ODI record is modest at best, where he averages 30.76 from 86 matches played, mustering just 2.338 runs. What really stood out about Laxman, however, was his craft; he looked more like an artist than a sportsman when he was batting. “He was a guy who could straight drive a ball similar to the one he has cover driven earlier, and if he’s on song, he may even roll his magical wrist to place it behind square," said Tendulkar at one of Laxman’s book launch events in Mumbai. That’s Laxman’s craft for you. When arguably the best batsman of cricketing history seems in awe of someone’s batsmanship, you know it’s Very Very Special, hence the moniker Very Very Special Laxman. Laxman came from an era of silken batting, of velvet touches and all round grace. Enough has been said about it, but you just can’t finish a piece about Laxman without mentioning his epic innings of 281 against Australia. It was an innings that signified a lot more than just a Test win; it was a profound declaration of the fact that India’s talented batsmen were ready to make the leap and become legends. There’s one regret Laxman has from his otherwise successful career. In spite of being a batsman of outstanding credentials and quality, he wasn’t able to make it to a World Cup team in his career, and you might also argue that he could have been given more matches to prove himself than 86. But as they say, all’s well that ends well. And when this Padma Shri awardee hung up his boots in 2012, he received plaudits from everyone - ranging from the greats of the game to young cricket fans who had grown up admiring his art.